Sarfraz Ahmed in action during his final game for Woodlands, which saw him sign off a Priestley Cup winner. East Bierley will be looking to make home form count as they battle to avoid relegation from the All Rounder Bradford League Premier Division. Bierley lie third-bottom, just 10 points above Morley, but have two home games remaining against Lightcliffe and Cleckheaton. 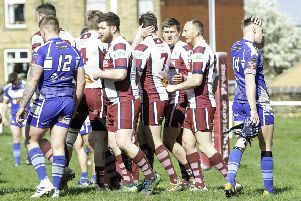 Morley face a tough game at home to leaders Pudsey St Lawrence and defeat there coupled with a Bierley win over Lightcliffe should be enough for them to avoid a nerve-wracking final day. In a further twist, Lightcliffe are just seven points above Bierley and need another win to be safe, so there could be some anxious times at South View Road. Scholes are 19 points adrift at the foot of the table and 29 off safety and look set for a quick return to the second tier, despite producing a battling performance at Bradford and Bingley last week. Scholes entertain New Farnley in their final home game on Saturday when only victory will give them any chance of keeping alive their fading survival hopes. Pudsey Congs are not yet mathematically safe and travel to Cleckheaton, who have had mixed fortunes this season but will be looking to end on a high. Celebrations went on long into last Sunday night at Albert Terrace, when the Woodlands team returned with the Priestley Cup following a superb win over Pudsey St Lawrence. Special presentations were made to retiring overseas player Sarfraz Ahmed, who will miss his side’s final two league games after returning home on Tuesday. Woodlands host Farsley on Saturday when victory for the cup winners would end the visitors’ title hopes. Woodlands Seconds are 11 points clear at the top of the Second Teams Premier and travel to second placed Farsley.